Veteran media personality A.B. Lalith de Silva was appointed Colombo district organiser of the Sri Lanka Freedom Party (SLFP) at a ceremony held at the `Temple Trees’ last week. 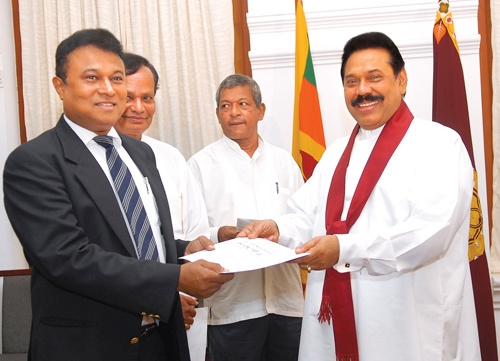 Here President Mahinda Rajapaksa hands over the letter of appointment to De Silva, the son of SLFP founder member and veteran educationist, the Late A.B.C. de Silva. Former Minister Nandimithra Ekanayake, who was appointed SLFP organiser for Matale district, is also in the picture. Five other SLFP organisers, G.H. Buddhadasa, H. Rohanadheera (Colombo district), H.W. Aruna Pradeep (Galle district), Sunny Kodituwakku (Ratnapura district) and Hudson Samarasinghe (Colombo East) too received their letters of appointment on the same day. Public Administration and Home Affairs Minister and Deputy Finance Minister Dr.Sarath Amunugama, in an interview with the Sunday Observer, said the country’s foreign direct investments have shown a four-fold increase. The next year the Government targets to attract US$ one billion. The Minister said the Government is hundred per cent confident of its victory at the forthcoming polls.